GMIT’s new workplace choir, GMIT Voices were crowned Best Newcomer on Saturday evening at the annual SCCUL Choir Factor event which took place in Clarinbridge. The choir of 65 took to the stage Singing Sean’s own acapella arrangement of “Down to the River To Pray” followed by Katy Perry’s “Rise” with piano accompaniment for the judge Dr Brendan O’Connor and the audience who responded with rapturous applause. 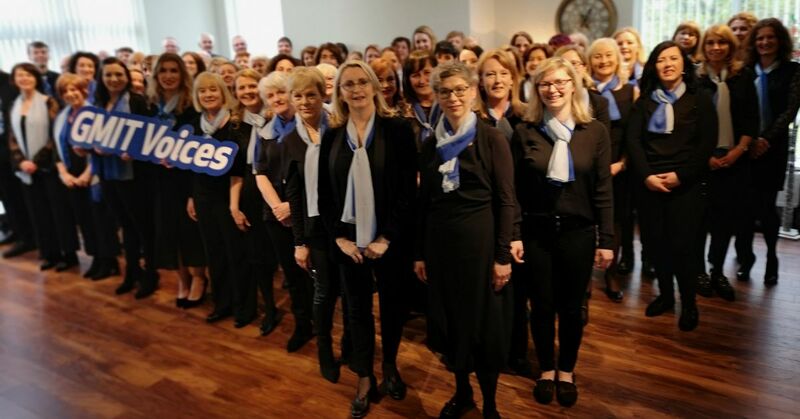 Against tough competition from ‘High Fidelity’ from Fidelity Investments and ‘Local Vocals’ from Galway Corporation/Council, the choir were thrilled to take home the winner’s trophy for their category. Formed just two months ago as part of the college’s Healthy Campus workplace initiative which promotes positive mental health and wellbeing, GMIT Voices is under the direction of local pianist & teacher Sean Rowland. “The choir have worked extremely hard and I am so pleased for them. It’s a great boost for the staff and the college itself. This was the choir’s first ever public performance outside of GMIT and I couldn’t be any more proud” said Sean. With participation from all departments across campus, the new work place choir has been a huge success. Chair person of the Healthy Campus Committee Anita Mahony had this to say “GMIT Voices has had a wonderful effect on the staff of GMIT and the culture of the Institute. Over 100 staff have come to some of our choir practices and more are still planning to join when their schedules are less hectic”.